Backpackers keen to visit the far-off eastern Indian city of Tawang or the green valleys of Pollachi or Kargil, may very well struggle to find suitable accommodation, in spite of the vast number of online booking sites and aggregators doing brisk business across the country. While large websites like MakeMyTrip.com, Yatra.com and Cleartrip.com are still growing their hotel and packages offerings, a bunch of smaller start-ups such as Stayzilla.com are aggressively adding more hotels to their networks, so that exotic but remote destinations can be easily accessed. Stayzilla.com essentially focuses on tier II towns and ensures that travellers can easily search and locate thousands of budget hotels across India, many of whom are not online. It has 3,800 hotels, lodges and even boathouses in its network. By implementing predictive algorithms, tweaking processes and mastering the art of supply chain management, Stayzilla.com has risen fast and generated Rs 1.68 crore in sales last year, with an operational profit minus the ad expenses. With revenue projections of Rs 40 lakh for the month of December this year, it is now creating a lot of interests among investors and is being heralded as the next big travel start-up from India. Stayzilla plans to raise an angel round between Rs 2.5 crore and Rs 5 crore from four unnamed investors. While two of these investors have committed Rs 2.5 crore to the start-up, other two plan to buy in the firm. This round of angel funding is expected to conclude by the beginning of 2012. After reaching more than 500 cities, Stayzilla is now getting ready to enter the big league. Read on to learn more about how Stayzilla was born, the people behind it, the challenges faced and strategic decisions that helped it grow into this niche and viewpoints on its future. An online entrepreneur even when he was still a student, Yogendra Vasupal developed websites for small companies and businessmen. It paid pretty well for a college-goer and at one point, Vasupal was earning Rs 3 lakh per quarter. But he was not satisfied. "I was just a middleman. Also, it was a volatile, no-guarantee business and my whole revenue stream could stop because of one person," he recalls. So in 2003, Vasupal and his college mates â€“ Sachit Singhi and Rupal Surana â€“ started researching online business segments in order to start up. They did look into various segments, such as books e-tailing and real estate classifieds, until they finally hit upon the hotel/hospitality industry. The hotel sector was highly fragmented, but that's exactly what made it right for a beginner, says Vasupal. "When a market is fragmented, nobody can lock you out. You can build a profitable core and sustain yourself," he explains. In July 2005, the team incorporated Inasra Technologies in Chennai and met with hoteliers. Within a year, it had signed contracts with 300 hotels and by 2007, this had reached 800 hotels across 150 cities. The technology platform was built and a beta version of the website was rolled out. In the early days, a customer who had booked a hotel stay in Manali via Inasra was informed that no rooms were available when she reached her destination. Consequently, Inasra decided to shut down for four months as the team wanted to double back and work meticulously to ensure that bookings were absolutely guaranteed. "It was a tough call and once you start your sales, it is also risky," says Vasupal. The start-up introduced double-checks with the hoteliers so that bookings would be available when customers arrived. By January 2008, Inasra had covered 250 towns in two states â€“ Tamil Nadu and Karnataka â€“ which were the focus at that time. Also, there was a growing demand for weekend getaways from Bangalore, the IT capital of India with a large, Net-savvy populace. However, competition was at its peak in the travel space in 2008. According to Vasupal, rather that sparring with 24 well-funded online travel agents to acquire customers, the team decided to again work on refining its processes. In the same year, the start-up found a mentor in Murugavel Janakiraman, CEO of Consim Info, one of India's top Internet companies. Consim runs Bharatmatrimony.com and the real estate classifieds site Indiaproperty.com. But even after the relaunch, Inasra was faced with booking issues. Outright confirmations only amounted to 45 per cent, which essentially meant that only 3 in 5 bookings were being confirmed while the rest fell through due to unavailability of rooms. Therefore, a strategic decision had to be taken at this point. Instead of working on booking confirmation, the start-up decided to sell information on pricing and availability of rooms in hotels. Inasra also stopped stocking contracts. Instead, the company built software that stored information on the availability of rooms, the relevance of such data, as well as tags of past data so that users' needs could be predicted. Data on the site were tracked and collated to predict which hotels were being preferred. As a result, outright confirmations on the website soared to 75 per cent by 2009. Rebranding: The initial name of the website â€“ Inasra.com â€“ was a handicap. The brand name had no recall, and customers did not get used to it. The start-up, therefore, decided to approach a creative ad agency for rebranding and out came Stayzilla.com. 'Zilla' has the connotation of something 'big' (from Godzilla, of course) and that has already been leveraged by the browser-maker Mozilla. But Vasupal says that the name also refers to the word 'zilla' which means district in India. Financial crisis: In 2010, the financial crisis delayed Inasra's plans yet again. "Timing is everything in the hotel industry. If you take any developed market, ticketing of flights, trains and buses were first offered online. When they stabilised, hotels and packages came up. That's because in the hotel industry, customer maturity takes time. We expected that 2010 would be the right time for the hotel industry to go online and wanted to position ourselves as the largest player in the accommodation market. However, the next three years will see the market soaring." Despite these hurdles, Vasupal is confident that Stayzilla is still ahead of the curve. "The aim was to earn barriers to entry that would keep us a year or two ahead of competitors in this market. I think we have accomplished that, even with the delays," he says. Stayzilla's advantage is its reach into the hinterlands. As of now, Stayzilla.com covers 560 cities and towns in India. And of this, the company claims that 300 cities are unique to it â€“ in the sense that none of the other hotel-booking providers has accommodation to offer in those cities. The site now receives 2,600 unique visitors per day. And interestingly enough, more than 60 per cent of these visitors are from tier 2 towns such as Salem, Mysore and Aurangabad. The website claims that it has a total of 50,000 users and is adding 130 users on a daily basis. It sells an average of 80 room nights per day and has an average transaction size of Rs 3,800. Stayzilla.com has built a network of 3,800 small hotels across the country. 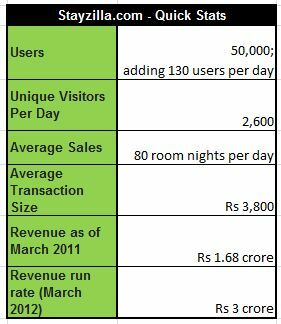 Compared to this, MakeMyTrip.com has some 5,000 hotels but the majority of them are top-tier hotels in larger cities. In fact, MMT's CFO Rajesh Magow had recently discussed the company's heightened focus on hotels with Techcircle.in. MMT's quarterly acquisitions and Via's adoption of an inorganic strategy to grow its travel network indicate that consolidation is rife in the travel space. However, Stayzilla is not keen on being bought over, even with the market finally maturing. In September 2008, a large Indian OTA entered into discussions with Stayzilla.com for a partnership. But within a week of signing a non-disclosure agreement, Lehman Brothers collapsed and the partnership did not finalise. Stayzilla generated Rs 1.68 crore in sales in the year ended March 2011 and claims to have been operationally profitable for the last 1.5 years, if you don't consider the ad expenses. Last fiscal, the company had Rs 18.5 lakh in expenses minus advertising. Also, the revenue projection for the month of December is Rs 40 lakh, says Vasupal. The start-up employs 16 people and plans to expand this to 25 soon. Its promoters have also made a fresh infusion of funds in an effort to cross the 5,000-hotels mark in the next six months. They will invest Rs 50 lakh over the next 2-3 months into online advertisements, set up a 24x7 call centre and ramp up its operations. Will It Be A Future Perfect? People who have invested in this sector clearly see an opportunity but also caution on the challenges. "The overall hotel market is a multi-billion-dollar sector. Even if you exclude the 5-star hotels, the market has a long tail," says Mukul Arora, an associate at private equity firm SAIF Partners that has backed MakeMyTrip. In this space, however, sites like Stayzilla.com or MyGuestHouse.com have a strong value proposition because there is a clear need for such a service. "Today, the way one books a small hotel is by using Just Dial to get the phone number and then enquiring about the availability and rooms. They do not have an option of looking at a picture of the hotel or doing more checks. So, there is very little choice," he added. But it's also true that scaling up a start-up in this domain with the current market conditions will be difficult, according to Arora, whose primary focus area at the PE firm is early-stage investments. According to him, the current market is very fragmented, making aggregation of information quite an uphill task. "With big hotels, you can partner with one and get hundreds of rooms across the country. But with smaller hotels, aggregating is difficult as one has to approach each hotel separately," he clarifies. The problem is compounded by the fact that budget hotels are not tech-savvy and many of them do not have a hotel management platform for bookings. As a result, scaling up manual inventory is difficult, compared to doing it with an IT backend. Then there is the issue of quality of service and standardisation. "As a customer, if I book a hotel through Stayzilla.com or MyGuestHouse.com and do not get good service, it will affect the customer's perception of the start-up. Given that these are small hotels, service levels are not standardised. Solving this issue of service quality will become the priority for start-ups in this sector," adds Arora. Two major trends that may aid start-ups like Stayzilla are the growing number of users from tier II towns coming online and the fact that they are looking for more budget travel options. "Around 40-50 per cent of the users of large and small-ticketing sites in India are from tier II towns. It is not as counter-intuitive as one might think and shows that people are transacting online. It is a combination of these trends that will drive growth," he adds.